Are the family favorites in your recipe card box collecting dust because of all the fake foods on the ingredients lists? If your family complains that they miss their old favorites now that you’re trying to eat less processed foods, I can help. The goal of Better Than a Box is to teach you to reverse engineer the processed parts of any recipe and create delicious real food renditions. You’ll gain confidence in the kitchen, finding the courage to toss in a little of this and a little of that, even if you’ve always been a “measure to the correct 1/8 teaspoon” sort of chef before. From habits and routines to make sure you always have certain things on hand, to tips for saving dishes as you cook up a storm, and even “recipes” you will be able to cook by heart, this book will help you have the real food lifestyle you want without compromising the food your family loves. Better Than a Box is so much more than a recipe book; it’s a way of cooking. Buy Better Than a Box in PDF or Kindle format! I worked on this book behind the scenes for about two years, no kidding. Recipe testers were trying things out for me after readers sent me some of the “old favorites” to try to reverse engineer for real food. It’s been fun tweaking others’ family recipes and then sending them back to see what the families think. Our family has discovered a few new favorites, that’s for sure! Today I’m excited to share a sneak preview with you, a free printable download of just one of the recipes included in Better Than a Box. 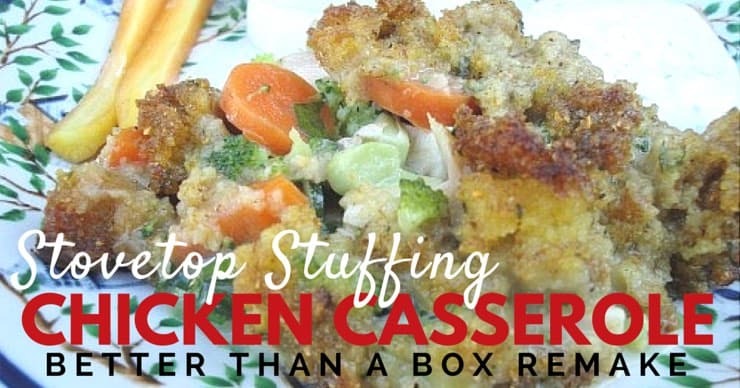 It’s the classic creamy chicken casserole topped with Stove Top stuffing mix…but no boxes, cans, or even bags were opened in the making of the new and improved “real food” version. There’s even a gluten-free rendition that is equally as good as, maybe better than, the original (and just as frugal!). If you can’t see the PDF above, click HERE to download. 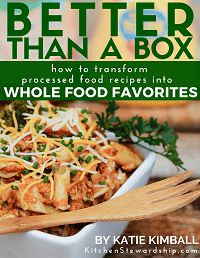 The entire first section of Better Than a Box is a teaching tool, an opportunity to step into the Kitchen Stewardship classroom and learn how to reverse engineer ANY recipe to make it work with real food. I share strategies, checklists, tips, and visualizations, and then you get to peek into my head as I tweaked recipes just like the downloadable excerpt above. CLICK HERE to check out Better Than a Box! Want to see from whence the crunchy-topped chicken casserole came? Preheat oven to 400°F. Prepare stuffing mix as directed on package; set aside. 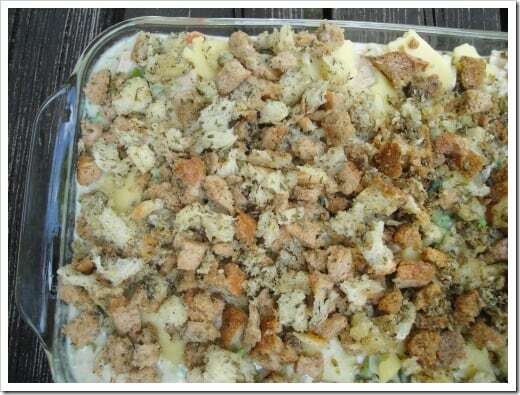 Mix chicken, soup, sour cream and vegetables in 13×9-inch baking dish; top with the stuffing. Bake 30 min or until chicken is cooked through. 2 can cream of mushroom (or any flavor) soup plus one soup can of milk, whisked together to make a thick gravy like consistency (more or less milk if needed)Place chicken in the bottom of a greased, 9×13 pan, pour “gravy” over it, then top with prepared stuffing. Bake at 350 for 30 minutes or until heated through. The amounts in each recipe were pretty different, so I knew it would be hard to go totally wrong as long as I hit all four categories. I increased the onion simply because I like more onion flavor. I added some chicken broth again, for flavor and nutrition reasons. I switched the chicken because I always have cooked chicken on hand from making whole chickens into chicken stock, and I advise as such in the book, too. Reverse engineering the stuffing mix took a little more doing. I read boxes of stuffing mix in stores and wrote down what was in them, along with the “how to” instructions, which includes melted butter. I estimated the quantity of bread crumbs that would be needed to nicely cover a 9×13 pan. I Googled “homemade stuffing mix” and started to compare the seasonings. I got an idea of what total quantity of seasoning should be used for 2-3 c. bread crumbs (about 2 ½ tsp. spices plus salt and pepper), and then I started experimenting. It turned out it was pretty hard to go wrong with these delicious seasonings and toasted bread! For a while I was making the dish with 2 ½ teaspoons total of parsley, thyme, sage, celery seed, garlic and onion powder, and another teaspoon of poultry seasoning! It was pretty intense flavor! I was making a new version at my mom’s, and she didn’t have the poultry seasoning. I Googled “homemade poultry seasoning” and it was then that I realized poultry seasoning had a lot of the same ingredients as I was already using. Hence, the “either or” options in the recipe, which is kind of nice in case you don’t have something needed. Testers (and my family) have enjoyed the recipe both ways. I’ve probably made the meal five or ten different ways, including sometimes two variations on one pan (toasted vs. untoasted bread, for example). Even with all the differences, I never made a meal that we didn’t like. Be bold in the kitchen! Experiment! You can makeover your recipes from scratch! Nicely done recipe! Liked that you included tips for children helping. I will be trying this! Well done! Oh my gosh this looks wondeful!! I have really misses this recipe since going Real Food/Primal. I even have a gluten free bread mix I can try to make the cubes bread for this!!! So excited to see more recipes from your new E-Book!! SOOO EXCITED!! Thank you so much for posting this! I am already planning on buying your book. It looks wonderful and you made the directions really easy to follow. I am so excited I might just pee myself…I was so close to discarding a pinterest recipe for Crockpot Chicken Cordon Bleu, but decided to wait…I haven’t made it because it calls for stovetop…but it just looks sooooooo yummy! Now I can try to make it!!! yay!! Love the format of the recipe, especially the variations and kids suggestions! I will be making it the near future and will let you know how the family likes it! Can’t wait for the book! 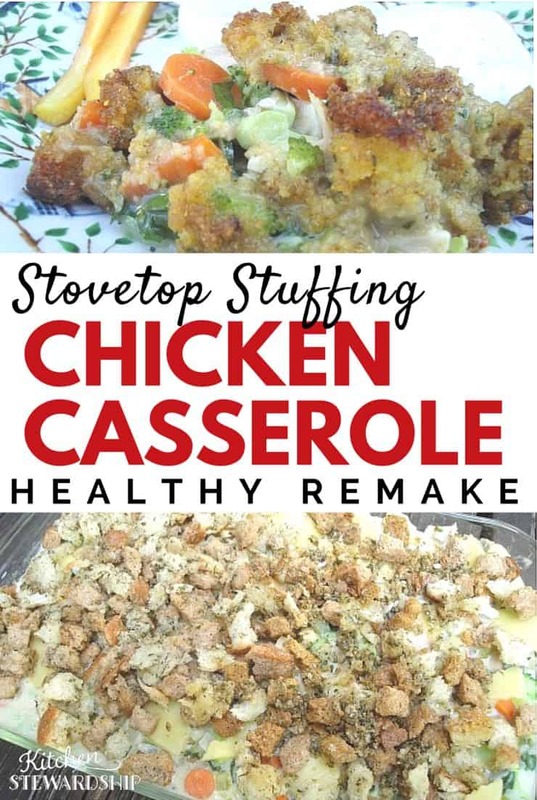 I was confused at first, because I didn’t know what Stovetop was, I have never had anything other than made from scratch stuffing. Ever. However, now that it is reverse engineered, it sounds like something we would make quite often. I have some stewing hens taking up space in the freezer right now. I like reading your thought process in adapting the recipe. At first glance I thought “Chicken and cream sauce can’t easily be made kosher, phooey.”. But after reading through the recipe I realized that I could easily make it nondairy (sub in coconut oil for the butter and use all broth). I might try it the next time I have soup chicken to use up! I’ll help u tastetest this! I grew up on stovetop (yuck!) & your blog has babystepped me thru real food. I’m a fan of your e-books. use them tons! This looks delicious! Can we buy your better than a box e book yet? Or is it not out yet? Just curious as to the approximate time the book will be available and will it be available on Kindle. In time for Christmas? Wow! I am so excited to try this. My husband grew up on creamed soup recipes and getting him interested in whole foods has been an uphill battle. I can’t wait until your book comes out. By the way, I love my Smart Sweets and Everything Beans books, too. Thanks for sharing your culinary creativity. This looks great, Katie! I’m so very excited about this upcoming e-book. I have all your other books, and enjoy them so much, because they are so detailed and full of helpful info. Not to mention the food is delicious! This looks great! The original recipe has sentimental value for me; it’s what my husband and his buddies made for the ladies on our first date. I always made it on the anniversary of our first date but haven’t for the last few years because I can’t bring myself to buy “cream of ___” soups anymore. I’m definitely going to try this! Yum… sounds a lot like the Chicken pot pie recipe I make from “good food great medicine” cookbook, just with a stuffing top rather than a crust. I think i will have to try this as it is a bit simpler and a great way to use up bread heels. I made this tonight and it was soooo good!! My family all loved it and best of all I felt good feeding my family real food. This is definitely a keeper. Thanks Katie! I have a recipe somewhat similar that uses fish. I would suggest that the meat in this dish could be easily substituted with whatever is on hand. I think that I just found the perfect dish for the leftover turkey at our upcoming Thanksgving meal! I also love that you think of us that can not eat gluten! Thank you, Katie! The only stuffing we eat is the one with cornbread as the main ingredient. But it must be a Texas thing. LOL We call it dressing, too.